It was a very friendly neighborhood, at least on our end. A friend who lived a few blocks away said there was a lot of hostility between neighbors on his street. I thought he might have been exaggerating, but saw first hand what he meant one Halloween night when two neighbors got into a front-lawn fistfight in front of several trick-or-treaters. Our street was so chummy I was able to invoke the spirit of Russet Lane by encouraging street games and backyard baseball. Several of us had vegetable gardens and there was a lot of spontaneous socializing. But most of all there were the boys and girls who got along so well with each other. The group up top are ready for the first day of school on what must have been a chilly September morning. They're not waiting for a bus; we lived closed enough to Scott Elementary School that they walked. 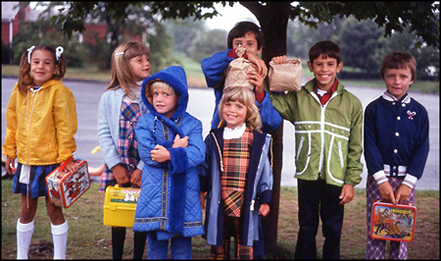 From left to right: Pam Mancini, Kim Sullivan, Laura Major, Scott Mancini (resting his lunch bag on Kristin Sullivan's head), Lenny Mancini and Jeff Major (with an "Emergency" lunch box we probably should have kept). To the right are representative of two more neighborhood families – Bobby Sullivan, who lived behind us, and Jennifer Cameron, who lived across the street. The Sullivans and Camerons were of much help when it came to my first gardening efforts. Jen's father, Don, set the pace for us. My favorite story involved his first compost heap, which included all kinds of scraps, even potato peels. He'd stick a pitchfork in it every now and then to aerate the compost, and one day he noticed this softball-sized things that seemed to be growing. Turned out – you guessed it – they were potatoes from those peels he had added to the mix several weeks before. There's one photograph I wish I had taken, though it probably wouldn't have matched the one I have carried in my head all these years. The occasion resulted from my attempt to build an igloo after one of the better snowstorms to hit Rhode Island during my time there. Rhode Islanders don't like snow, and most of them, I'm sure, didn't appreciate the one I'm talking about, but it did hit on a weekend, which minimized the inconvenience. The snow was, to use a technical term, good packing. Which meant it was perfect for snowballs, snowmen (and snowwomen) and forts. So I made bricks and tried to form an igloo in our front yard. As usual, I attracted several of my children's friends who all pitched in. But eventually I noticed the igloo was getting very high and I wasn't sure how I'd complete the roof. I never did fill the hole in the top of the igloo the way I wanted to, but I improvised, with cardboard, I think. I was disappointed, but we had managed to build an unusual snow house. You don't find many in which a man who is almost six-feet-four can stand in, with room to spare. 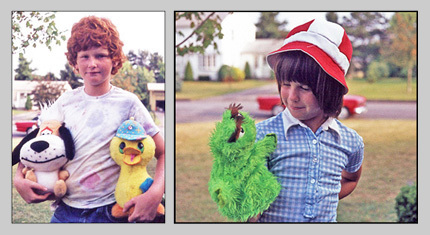 That evening about bedtime I heard voices in the front yard. I should have known better and simply ignored it, but instead I went outside to see who was there and what they were doing. My "Who's there?" went a bit over the top, which frightened the two teenage neighbors – Tom Connelly and, I believe, one of the brothers of our babysitter, Judy Saintsaveur. Instead of crawling out the front door, they burst through the wall, leaving behind the kind of outline of their bodies that you only see in cartoons. That's the picture I wish I had. Before Boston had its Big Dig to construct a tunnel to connect downtown with Logan Airport, we had our own next to our garage at 61 Douglas Road in Pilgrim Estates, Warwick, Rhode Island. It was purely accidental and it had one of the craziest endings I've ever experienced throughout all of my efforts to grow things. What happened was this. The previous owner had planted strawberries in this spot, but the plants hadn't been tended and I figured to rip them all out. But I had other things on my mind, like the flagstone patio I wanted to build outside my side door. 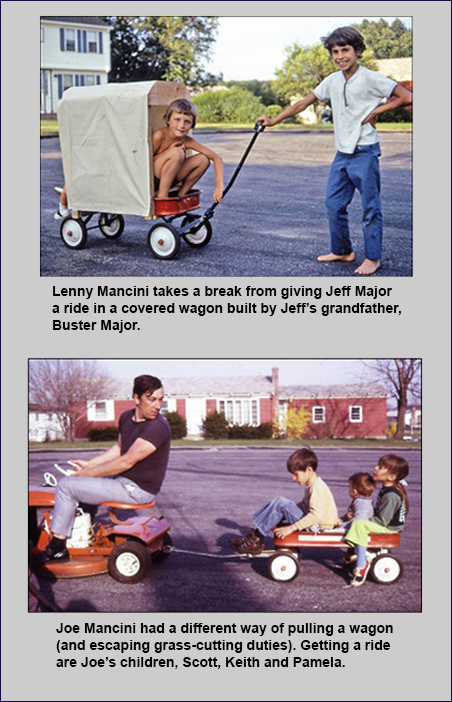 So neighbor Joe Mancini and I got to work one day, dumping a load of sand next to the garage for use in the cement mixer I had rented. 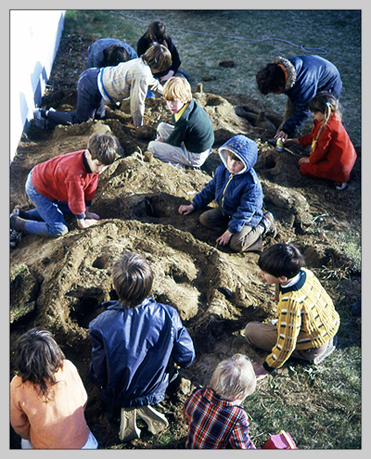 When Joe and I finished, there was a sandy mess by the garage, and it briefly turned into a popular digging area for neighborhood children. It was like a day at the beach. We let it continue for a few days, then I cleaned up the mess and raked the area level. The following spring new strawberry plants surfaced and produced enough fruit for a month's worth of shortcake. Mother Nature sure is a tricky devil.